Syed Tabish worked as an IT specialist at IBM in India before his MBA, but was never fully satisfied with back-end development. He wanted to know the purpose of the applications he was building and what business problems they were addressing. As he transitioned from a developer to a quality analyst, he gained a more holistic picture of the company and realized that he wanted to play a bigger role and make an impact. It was this that set him on course for a full-time MBA at Hong Kong’s CUHK Business School in search of a deeper understanding of how big business operates. 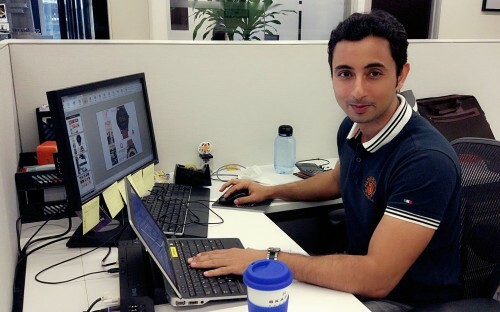 Since completing his degree, Syed has transitioned into the world of digital marketing with an internship in Hong Kong. Intrigued by the speed at which digitization is occurring, Syed wants to bridge the gap between technology and business. Why did you decide to pursue an MBA at CUHK? China is the world’s second largest economy and any movement in its economic data sends share prices soaring or tumbling globally. India is also coming up rapidly and, together with China, it drives major chunk of world economy. So, I knew that I wanted to do my MBA in Asia and I was looking for a cosmopolitan hub which could connect me to east and west. Hong Kong fit the bill perfectly. CUHK is one of the oldest universities in Asia and has the longest-established MBA program. The school has a proven track record and accreditation. The program also puts lots of emphasis on Asian business and its impact globally. Apart from the learning experience, I also wanted to connect to one of the largest alumni networks in Asia, and CUHK has a huge alumni network worldwide. I knew there would never be dearth of people to reach out to after my MBA. Why have you decided to move into digital marketing? I stumbled upon digital marketing during my MBA program. I was meeting a lot of people thanks to our networking sessions and wide alumni network, getting their advices and opinions, and listening to them talk about their views on different aspects of business. During one of those sessions, digital marketing really caught my interest. I decided to do some research. I talked to more people working in this field, attended seminars and sessions in Hong Kong, and did lots of research online to understand more about it. With the pace at which we are going digital, everything will be connected and there will be so much information available to make decision making process more complicated for businesses. I’ve found that with my technology background and the business acumen acquired during my MBA, I can help organizations in their digital journey. How has the CUHK MBA helped you change career track? The CUHK MBA was not only a degree, it was an experience for me. It would be cliché to say that its life changing experience. But I would still say that because it is, personally and professionally! You get to meet people from diverse backgrounds and learn a lot from their experience. If you are doing an international MBA, you also get to experience lot of cultural diversity and start to see things from different perspective. These things can be applied to any field and not only digital marketing, because no matter which business you are in, you are ultimately serving the people. If you are not able to understand them, how can you expect to serve them? One thing I would pick that has helped me most is seeing things from different perspectives. It helps me think about the multiple implications that a decision has. I’m more efficient at making decisions because I see the implications across different roles and functions, which you would normally miss. What advice do you have for prospective MBAs? To enjoy the journey you need to immerse yourself. You left your job and comfortable life to join the rigors of MBA so let nothing stop you from doing that. Be ready to learn inside and outside the classroom. In terms of careers advice, it’s good to know what you want to do and where you want to go professionally, but never let that limit your horizon. Be open to explore. Open your mind—you never know what will get you excited!